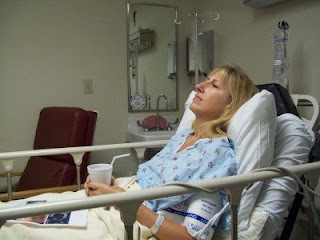 Melissa came down for the weekend to take me to my second endoscopy. It was called an EUS... endoscopic ultrasound. It was done at Spohn Hospital South. 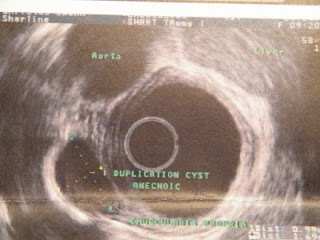 The previous exam found a cyst but they did not have the equipment to do an ultrasound. I was sent to Dr. Armstrong, a very handsome young Dr. with a charming European accent. But first, I had to get through the scary creepy Indian nun bearing needles. 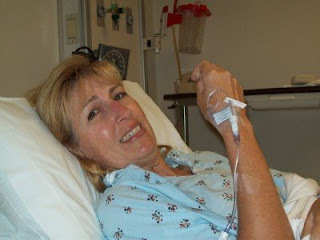 She wanted to start an IV without deadening the insertion site. No! This was not going to happen! I explained to her that I was a needle phoebe and that I had previously born 2 children with no IV because I was afraid of them. So, she went off chuckling to get an order for the injection to deaden the site. Chuckle chuckle, girl wants 2 needle sticks instead of just one... chuckle chuckle... I don't know how she had 2 children.. chuckle chuckle... She came back in a minute with the injection and did the IV. Oh and there was also an injection of phenegren to keep me from throwing up. The nun didn't even try to lie to me and say that it wouldn't hurt... she said it was a very nasty stinging injection and that it would hurt for days afterwards! This was the worst part... scary creepy Indian nun! 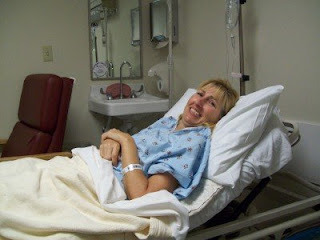 OK, maybe it wasn't the worst part... that would be when they took me off to the procedure room. 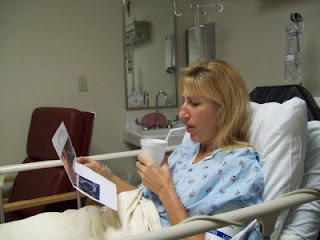 I sat there with a very nice nurse named Evangelina who told me stories and talked to me to keep me from wigging out. My blood pressure was up. She finally suggested to the Dr. that we give me something to make me go night night as I was very "anxious". Well why shouldn't I be anxious getting glimpses of the sinister looking instruments the other nurse, Sylvia was preparing over my right shoulder almost out of my range of vision. Out I went. Here is a picture of the ultrasound. It shows this cyst being close to my heart. I have reasoned in my mind that maybe this is why when I get stressed out and clench up, I have what feel like chest pains... maybe this cyst is crowding my heart. I don't think the Dr. told us much other than that I would get my results from Dr. Kim... my appoint- ment with him is on the 4th of May. I'm just very glad it's over.